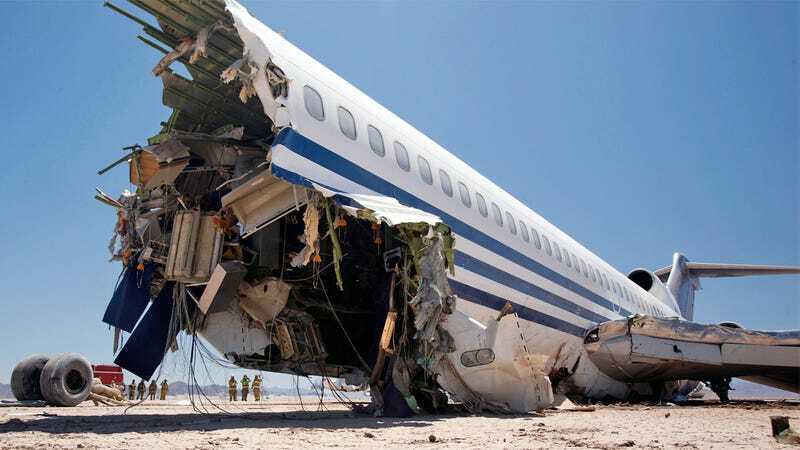 In Discovery's upcoming season of the show Curiosity, they crash a Boeing 727 into the desert. No, this isn't in a computer. It isn't a simulation. They really do it. In 1984, NASA test crashed a plane in the Mojave Desert. Since then, there have been precisely zero full-scale crash tests. For this season, Discovery decided to do what had not been done in nearly 30 years. This is what they came up with in four years of planning. It's badass. The plane flies up over the desert, and then, amazingly, all of the crew jump out. All that's left are crash test dummies. Dr. Cindy Bir outfitted the plane with high tech crash dummies three days before the crash. These dummies can provide a ton of data as to what went right and wrong for people in the crash. And at $150,000, these are not cheap dummies. If you have any questions about the dummies, hold them till tomorrow when Dr. Bir comes in to our office for another installment of Jalopnik Live. Now, before crashing the plane, scientists went into the plane to equip it with sensors that would judge the forces that are placed on the seats and the occupants and to know just how hurt they'd really be. Here's a tip: While first class may be comfier, it isn't any less or more safe than any seat on the plane. The accelerometers will be able to tell the researchers which seats would be the worst to be in. From inside the plane, the crash is eerily tame. Sure, the overhead bins — which are empty — fall on the passengers' heads, but for an agressive crash, it almost seems gentle. But was anyone killed? Well, we cannot divulge that yet, so you'll just have to watch CURIOSTIY Plane Crash when it airs October 7th on the Discovery Channel at 9 EST.